Former Maricopa County Sheriff Joe Arpaio speaks at the 2019 Lincoln-Reagan Dinner in south St. Louis County. By his own admission, Joe Arpaio wasn’t exactly a shrinking violet during his lengthy tenure as sheriff of Maricopa County, Arizona. And the former GOP official didn’t shy away from his past controversies during his speech Saturday night at the St. Louis County Republican Party Lincoln-Reagan Day Dinner — or his robust defense of President Donald Trump’s administration. The above audio is Joe Arpaio's speech at the St. Louis County Lincoln-Reagan Dinner on March 23, 2019. Arpaio served as sheriff for 24 years. He gained national attention for his hard-line stance on immigration. That gained him fans among Republican activists — and foes from across the political spectrum. During his speech, Arpaio touched on a number of controversies that popped up over his political career: Placing detainees in tents, being found in contempt of court, questioning the validity of former President Barack Obama’s birth certificate and even getting into a tiff with NBA Hall of Famer Shaquille O’Neal. But much of his speech centered around Trump, whom Arpaio endorsed during the 2016 presidential campaign. He contended that Trump, who issued a pardon to Arpaio in 2017, is getting more criticism than a typical president because of how he speaks his mind. Even before he entered a south St. Louis County banquet hall on Saturday, people from both parties criticized Arpaio’s appearance at Lincoln-Reagan. For instance: State Rep. Shamed Dogan, R-Ballwin, said the decision to bring Arpaio in was a “perfect encapsulation why the GOP keeps losing ground in St. Louis County and suburbs everywhere.” He noted that Arpaio lost re-election in 2016 when Trump carried Maricopa County. St. Louis County Republican Party Central Committee Chairwoman Rene Artman contended that Arpaio became a target after he endorsed Trump in the 2016 election. Some speakers at the Lincoln-Reagan Dinner spoke out against a proposed city-county merger. Besides Arpaio’s address, a plan to merge St. Louis and St. Louis County was a prime topic of discussion during the Republican event. A group called Better Together is seeking to create a metro government that would oversee what is now St. Louis and St. Louis County. 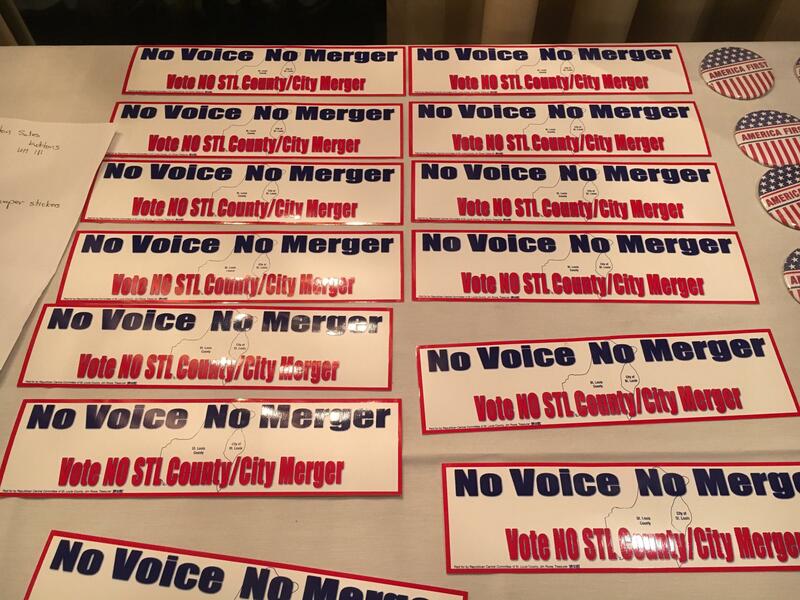 The St. Louis County Republican Central Committee voted to oppose the merger plan. And speakers like St. Louis County Councilman Mark Harder, R-Ballwin, called on GOP activists in the crowd to actively fight back against the proposal. Since Better Together is taking its plan to the statewide ballot, it’s possible that the merger could fail in the city and county and still be implemented if it gets enough votes in other parts of the state. That’s one of the reasons that Gary Wiegert of the St. Louis Republican Party says GOP activists will need to expand their opposition campaign beyond St. Louis and St. Louis County. Better Together hopes to place the city-county merger proposal on the 2020 ballot. On the latest edition of the Politically Speaking podcast, St. Louis Public Radio’s Jason Rosenbaum and Jo Mannies welcome back St. Louis County Councilman Mark Harder to the program. The Ballwin Republican represents the council’s 7th District. It takes in a number of large municipalities in St. Louis County, including Chesterfield, Wildwood, Ellisville and Ballwin. This article first appeared in the St. Louis Beacon, May 11, 2011 - The St. Louis Police Board approved this afternoon a long-stalled collective bargaining agreement with the St. Louis Police Officers Association. But the agreement is no longer the crucial piece in a carefully constructed puzzle that city officials and their allies hoped would lead to the state Senate's approval of a bill granting the city control of its own police department, which has been under state supervision for 150 years. This article first appeared in the St. Louis Beacon, March 28, 2011 - Bill Hennessy, the founder of the St. Louis Tea Party, says it was his decision to tap Gary Wiegert, former president of the St. Louis Police Officers Association, to serve as an unpaid ally to represent the tea party in talks with members of the Missouri Legislature. Hennessy also said in a video, posted Sunday on his website, that Wiegert registered as a lobbyist with the Missouri Ethics Commission at Hennessy's behest, even though Wiegert won't be paid and will be a volunteer. Hennessy said he had received legal advice that Wiegert might otherwise run afoul of Missouri's ethics laws.